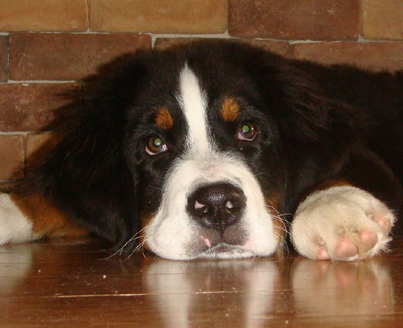 Teddy Bear Love, Bernese Mountain Dog Website - AKC Bernese Mountain Dog puppies. Exceptional dogs for special people. According to AKC the upcoming holidays can pose special health dangers for our four-legged friends. Each year, thousands of pets become seriously injured or ill during the holiday season, while their owners are busy with shopping, baking and entertaining. The AKC Pet Healthcare Plan, has paid many claims related to the holidays. Some of these have included a Bernese Mountain Dog that ate a tree ornament and a German Shepherd Dog that chewed and swallowed a battery-operated toy. Even more serious claims paid include $1,768 for an Airedale Terrier, who grabbed and swallowed a turkey skewer as it fell from the kitchen counter and $3,738 for a Labrador Retriever, who ate a kitchen towel and a potholder during a holiday meal. Pets can become very ill from a variety of common holiday meal items, including table butter, meat and candy. These foods can result in gastrointestinal upsets and pancreatitis, a painful and sometimes fatal condition. When these conditions occur, pets might exhibit depression, vomiting, abdominal pain or lack of appetite. Eating tinsel, ornaments and garlands, even drinking the Christmas tree water, can lead to serious stomach irritation. In addition, poisoning from Xylitol (a sugar-free ingredient found in baking goods, candy, and chewing gum) can cause a severe blood sugar problem leading to weakness, depression, and seizures. Chocolate is another common cause of holiday accidents for pets. Many types of concentrated chocolate, particularly baking chocolate or dark chocolate, can cause serious health problems depending on the size of the dog. During the holidays, prevention is really the key. Place high risk items and holiday foods out of reach. Dogs also like to chew on electrical cords, gift ribbons and strings. Watch for symptoms of restlessness, tremors, seizures, vomiting and diarrhea and seek immediate veterinary treatment for them. Of course, our pets' health and well being is a responsibility that goes beyond just the holidays. Don't let innocent holiday traditions jeopardize the health of your pet. Evaluate the potential risks of your holiday decorations, plants and meals (see chart below). And, in the hustle and bustle of the season, remember regular feeding and exercise schedules and be certain to give your dog lots of love as you start off the New Year. As far as the tree tips, take a few moments to go over some safety precautions before putting up your tree. 1. Choose the Right Spot. Pick an area where the tree can be enjoyed by the family but remains out of heavy traffic. A lot of activity near the tree can result in accidentally knocking it over. An area by a wall or in a corner is ideal, especially one which is out of the traffic flow pattern of the house. Try to place the tree near an outlet so you don't have to run electrical cords long distances. 2. Prepare the Area. If you have a live tree, you might need to use some extra precautions. Lay down plastic sheeting or buy a "tree bag" before setting it up. This is an extra large trash bag used for live trees. Center the tree on the bag. When the season is over and you have removed the tree ornaments, pull the bag over the tree. This will catch the pine needles as they fall from the tree - and prevent them from being chewed or swallowed by your pet. 3. Secure the Tree. Many trees have been sent swaying by a rambunctious dog or puppy . Dogs can knock over a tree by rubbing against or playing under it. Pets can be injured if the trees or ornaments fall and break. You can place the tree in a corner and secure it from two sides to small hooks in the walls. Another trick is to place a small hook in the ceiling above the tree and use clear fishing line from the top of the tree to the hook. Apply gentle tension and tie. The clear line is invisible. While you're at it, make sure that the base of the tree is firmly secured and does not wobble. 4. Hide the Cords. Electrical cords are a grave danger to pets - especially puppies and dogs that tend to chew on anything. Cords can cause electrocution and serious injury or even death. Secure the cords by positioning them higher than the pet can reach or hiding them with special covers. 5. No Hooks. Check your ornaments and replace hooks with a loop of string tied in a knot. Ornaments often fall from the tree and pets may catch their mouths on or swallow the hooks. 6. Choose Safe Ornaments . There is no perfectly pet-safe bulb, as any ornament can be ingested and cause an intestinal obstruction. Pet "safer" bulbs would be plastic or wood. Glass bulbs on the lower limbs can be especially dangerous. If broken, pets can step on them and cut their feet. Worse yet, they can even treat the bulbs like a ball and chew on them, causing them to break and result in mouth or throat trauma and bleeding. Many pet owners have learned the hard way not to place any ornaments on the lower limbs. Ornaments made of food may be especially attractive to pets, so beware of popcorn garlands and similar treats. 7. Ribbons. Big red velvet ribbons are a lovely addition to a holiday home. They're also a safer replacement for the tinsel and garland that can be eaten by dogs and get caught in their intestine. Cats are especially attracted to the bright shiny tinsel, so it should really be avoided in households with cats. Ingestion of this material can cause intestinal obstruction that may require surgery. 8. Presents. Dogs love to investigate and most don't understand that the presents are not meant to be opened ahead of time. Gifts can be destroyed by a playful pet, and the decorative wrappings swallowed. Consider storing the presents in a safe area until right before the holiday or make sure your pet is always supervised while investigating and searching for his special gift. 9. Sweep and Water. Sweep up the pine needles. Ingestion of needles can cause vomiting and gastric irritation. Keep the tree watered and only turn the lights on when you are at home. There is always a risk of fire with a live tree, so take extra precautions. Do not allow your pet access to the tree water, as drinking it can make them ill.
10. Supervise. The safest thing to do is to allow your pet access to the tree only when supervised. Pets that continue to bother the tree should be rewarded for playing away from the tree. (Now is a perfect time to offer them a great new toy to keep them occupied and out of trouble.) Bitter apple can be sprayed on low branches for persistent chewers. I hope these give you some great tips. Many people love to decorate their trees and remember how and where they got their ornaments. I cherish certain ornaments like the paw print ornament. Please e-mail us if you would like to be included on our puppy birth announcement list! Our puppies come with a 5 year health guarantee. So if you are seeking a new companion, please call us for information on present and future litters.